Since the office is a mix of elected officers and hourly personnel, schedules rarely align to allow this type of opportunity. However, G. T. Ng, Secretary of the Adventist World Church and department head, asked for a trip to be organized. In June, the group set their sights on the small island-nation of Dominica, where Maranatha Volunteers International has been helping rebuild after the island was devastated by Hurricane Maria in 2017. Thousands of structures were destroyed or damaged, including 28 out of 34 Seventh-day Adventist churches. Twelve Secretariat staff and eight family members traveled to Dominica to help construct a new structure for the Beryl Seventh-day Adventist Church, which was totally demolished by the storm. Without a church, the 70-member congregation has been meeting in the pastor’s home for worship. A new building will be a relief after cramming into a living room for the past year. Besides laying block walls, volunteers held children’s programs and evangelistic meetings. They also distributed donated items like school supplies. The deepest impact felt was in personal interactions. The team worshipped with a local congregation on Sabbath and brought communion sets to donate. They discovered the church had been praying for a way to acquire a set; they were supposed to observe communion the following Sabbath, but didn’t have the supplies. Now, God had provided a communion set–an answer to prayer. As the team headed home, they wished they could do more. Dominica is still in need–many volunteers left their personal clothes and shoes behind. However, the experience prompted a renewed focus within the Secretariat Department to embody their mission. Staff became the missionaries they so often interact with in their daily work. 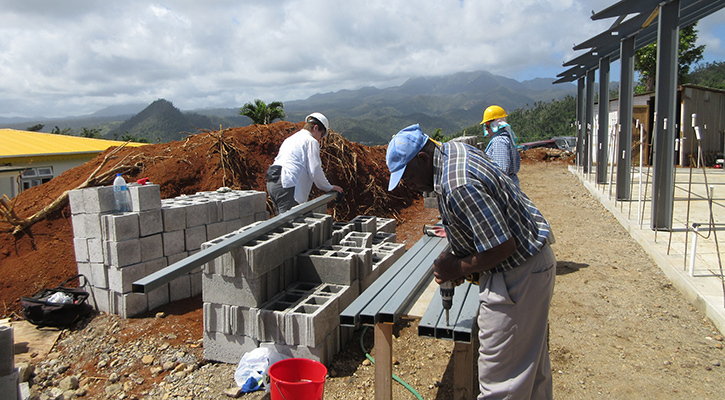 This is the second time Maranatha has assisted in reconstruction efforts in Dominica. In 1979, Maranatha helped to rebuild schools in the country after Hurricane David. David was a Category 5 hurricane that made landfall on Dominica; Maria and Irma were Category 4.